Having only ever visited Copenhagen on my own before, it was truly a treat to take JJP (the boy) away for our second anniversary to the land of colourful houses, smørrebrod and the loving home of Carlsberg. It’s wonderful to have such a diverse destination less than two hours away and with flight prices starting from a mere £40 return, it would really be rude for you not to visit. I wholeheartedly believe in discovering a city on foot, especially when there is a ton of colour to be found and secrets don’t come to those who spend time underground. We went with walking in mind and walk we did. Although I asked for recommendations, I tried to resist the temptation to go to other people’s picks and find my own, although special mentions to Hannah in the House, Bloomzy, Chopstick Panorama and Lauren Alexa for their tips. I’d advise you take a look at their own guides for some more top notch recommendations! However, if colour loving is your thing, read on ladies and gentlemen, for I think I’ve got that part covered. Of course this is largely on everyone’s list whether they be colour hunting or simply being a tourist. We’ve seen it in oh so many films and as one of the most easily accessible, idyllic settings in the centre of the city, it’s realistically hard to not come across it, even if by pure accident. The area is ultimately at its best when pictured against a bright blue sky, so you may want to consider looking at the weather forecast for your visit, but ultimately grey will totally do in real life too – the 350-year-old buildings do most of the talking in any case. What you may not spot quite so easily in this picturesque area is that just around the corner from the pretty little buildings (near Kongens Nytorv metro station) lies a mural by Makulator titled ‘Colors of Nyhavn’. The mural is Nyhavn’s eccentric facade concentrated as a barcode and while providing a pretty snazzy backdrop to any obligatory selfies, the artwork also leads to further stories of Nyhavn via the QR code placed on the wall. Quite simply, it’s a gorgeous place to discover vibrant hues and start your Copenhagen journey. Quite frankly (and weirdly) every insane building we came across in Copenhagen was a cinema – the Danes sure like to spark the creative side of the brain before your even embark on a cinematic experience. The Palads is just one of them and if you’re in the Tivoli area, make sure you are on the lookout for the flashes of pink and purple hues between buildings. The lights of Tivoli and passing traffic do their best to keep this one a little bit of a hidden gem. The cinema itself is one of Copenhagen’s largest and showcases the widest range of films in the city (there are a grand total of 17 auditoriums). The building was once home to Copenhagen’s former central railway station before it ceased operations in 1911 and became home to Scandinavia’s largest entertainment centre in 1912. I wouldn’t blame you to think that the pastel coloured facade was a recent addition to the cinema – I certainly thought it was – but actually, this vivid vision was painted by visual artist Poul Gernes in 1989. While you may not be after a film on your visit, Palads is well worth a visit for its pretty in pink atmosphere and geometric vibes – one for any colour seeker and architecture lover. Superkilen was smack bang at the top of my list for visiting after seeing it on various Instagram feeds and the likes of dezeen. 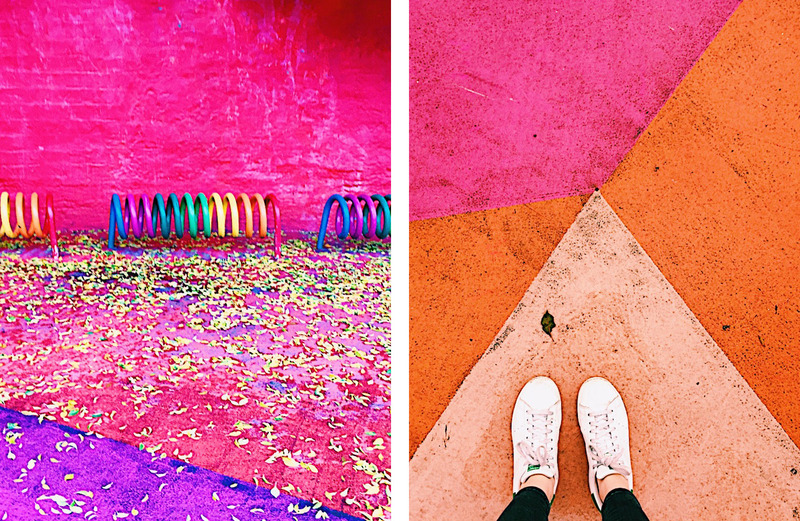 With its monochromatic skate park vibes and the super hot pink walkways, the park is the coolest I’ve ever seen, attracting crowds of photographers and artists seeking inspiration and providing the best playground EVER for local kids. Really, what more could you want in life?! Designed by the arts group Superflex in collaboration with Bjarke Ingels Group (those guys that did this year’s Serpentine Summerhouse) and Topotek1, a German landscape architecture firm, the park is intended to celebrate the diversity of Copenhagen by bringing together monuments from the different cultures that inhabit the area. You’ll discover everything from Moroccan tiling, English bins, American picnic tables to Japanese sculpture on your visit and every one of them will be a treat! A word of warning – Nestled on the outskirts of Nørrebro, this long strip of park doesn’t have the biggest of openings, so do keep your eyes peeled when in the area as it can easily be missed if on the other side of the road! Another place that should sit firmly on your to-do list is the region of Christiania, also known as Freetown Christiania, due to the community-led atmosphere and independence from the rest of Copenhagen. While some people do describe the area as a little scary, I’ve actually found it pretty celebratory and a very happy-go-lucky place. It’s certainly unlike any other neighbourhood I’ve ever visited and extremely different from the surrounding areas which can occasionally seem a little bit sterile. Pusher Street is where all of the naughty action takes place but I’ve never experienced any hassle – just keep your wits about you, take note of the Christiania rules, and enjoy the hippie and amazing street art vibes! Copenhagen is a bit of a dream when it comes to the world of shopping, with Danish design at the forefront even in the central shopping street and other central destinations. Independents seem to thrive in the outskirts and gentrification just doesn’t appear to have affected the smaller areas as much as I’ve seen in other major cities. Of course no visit to a Nordic country is complete without a visit to the likes of Weekday and the Acne Archive but do take note of the insane amount of boutiques in Vesterbro and Nørrebro as well as the incredible record stores (such as Route 66, pictured above) and of course the vintage treasures waiting to be found in the abundance of thrift stores. Studio Arhoj had to be my favourite design-led element of the trip and I can 100% recommend making the journey from anywhere in Copenhagen. We left it right until the last minute of our trip (literally on the way to the airport) and for a little while I thought it was gonna be a no-go after google maps dropped us off on a completely remote street corner. Stick with it though / just note down the actual address and you’ll soon come across the magical neon lights – leading you to a wonderful discovery – one that you’ll keep on going back to for more. 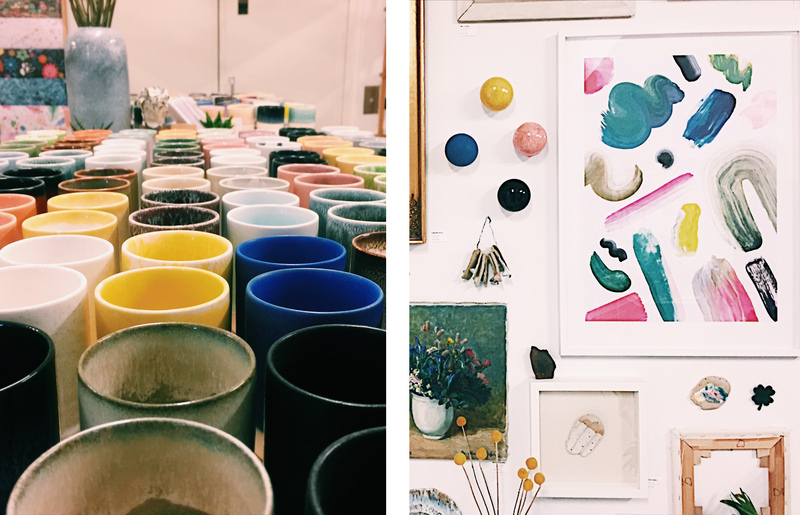 The studio come shop is the perfect light-filled space, filled with ceramic delights and Studio Arhoj’s trademark paint drips. Founded by Anders Arhoj, the practice originally started in Tokyo and therefore combines traditional Japanese culture with simple Scandinavian ideals. The result? High-quality craftsmanship and one of a kind pieces oozing pastel colours and bespoke patterns. With effortlessly cool music pumping from the speakers and a chance to nosy at the studio itself, I found it rather hard to leave this design mecca, at least without a few things to bring home for my plants anyway. GO GO GO! 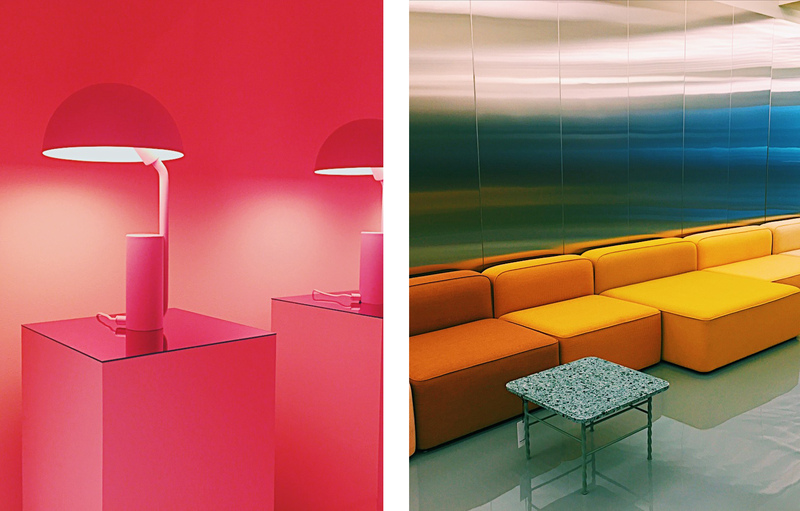 This recently refurbished showroom has serious colour goals, those which you might not expect from a Danish furniture brand. True to Copenhagen style, they still make the arrangement look both effortless and minimal but with the bold addition of colour blocked walls and hand-picked pieces from the likes of Acne, the result is experimental and unlike the traditional appearance of Danish design. While you may not have enough luggage space for the uber-cool furniture, the stationery store is a travellers dream and it’s here that you can pick up souvenirs for your loved ones. The perfect minimal bulldog clips, ice cream coloured pencils, an endless amount of sweetly patterned notebooks. Okay, so the recipients will have to be as stationery obsessed as me! P.S I won’t spoil it too much but downstairs definitely embraces all your 5 year old selfs future hopes and dreams. Oh Hay, what can I say? If you’re looking for major interior inspiration as well as one of the best views of central Copenhagen, Hay House should be your first shopping pit-stop. Taking over the 2nd and 3rd floor of a modern building on Copenhagen’s main shopping street, the store is set up in an apartment style setting with beautiful layouts and gorgeous displays highlighting Hay’s furniture range and accessories. While we’re probably quite accustomed to seeing a little bit of Hay in the UK now, I can assure you that’s not a reason to leave it off your list of destinations for the visual merchandising and extensive range of different products is really not to be missed. ‘Scuse the list here but there’s only one way to sample food and that’s by tasting it yourself. Here’s a few that we tried and loved so get your comfy pants on and get on it! Big Apple – Juice bar with the best sandwiches. Just down the road from the ever so popular September Atelier but much less busy, prettier and better value in my opinion! Scarpetta – A delightful contemporary Italian with Danish ideals in Islands Brygge. Get the tasting menu and have it adapted if you are vegetarian – the results are insane and super fresh. Pretty much every person I spoke to recommended a Cofoco restaurant so take a look at the others that could be near you. Laura’s Bakery – Want the best cinnamon bun Copenhagen has to offer? It. exists. right. here. The Coffee Collective – Patterned coffee cups filled with majorly good, strong coffee. Yes please. Bob – Industrial looking organic restaurant in the meat packing district. Meal sizes differ but a healthy option nonetheless! The Laundromat Cafe – A colourful cafe filled with colour indexed books that is also sure to fill you up. American dining feels with a Copenhagen twist. Mother – Heart Italian with good pizza, bruschetta and plenty of cheese on offer. Gets v.busy so booking advisable! Copenhagen has culture on every single corner, literally, whether that be via street art, architecture or a simple historical statue. When you can cycle or walk the whole city with ease it’s hard to resist the temptation of becoming a permanent resident, especially when you can imagine a Sunday sipping coffee in the botanical gardens or a hungover afternoon in Kastellet (one of the the world’s best-preserved star fortresses). We had to do a few of the touristy, albeit slightly less colourful things on our visit and while next time I’ll be including more art galleries, these picks are also worth taking the time to experience. Now, we have to factor in the boys sometimes and a trip to the town of Carlsberg ensures major girlfriend points and of course a cheeky tipple for yourself too. Yes, Carlsberg is home to that special drink that has us reminiscing of summer festivals back when we were young, but no, it doesn’t actually taste as bad as you remember it to be. 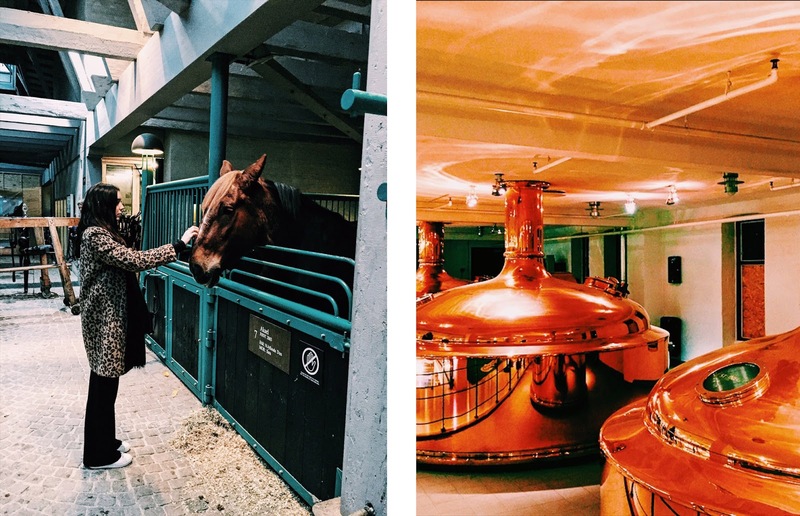 Guarded by huge concrete elephants, the town itself is in major renovation mode at the moment but the brewery is still running in full swing and indeed, there are very cute horses. Try out all the brews in the homely bar avec huge copper machinery and take home a few Elephant beers from the gift shop for good measure – they’re actually quite tasty! If you hadn’t figured it out just yet, I really am not one for touristy destinations, I can’t really say it anymore. HOWEVER, after walking past The Round Tower a couple of times during our trip I was suitably intrigued by the general aesthetic and the ridiculously cheap entry price (for Copenhagen at least). 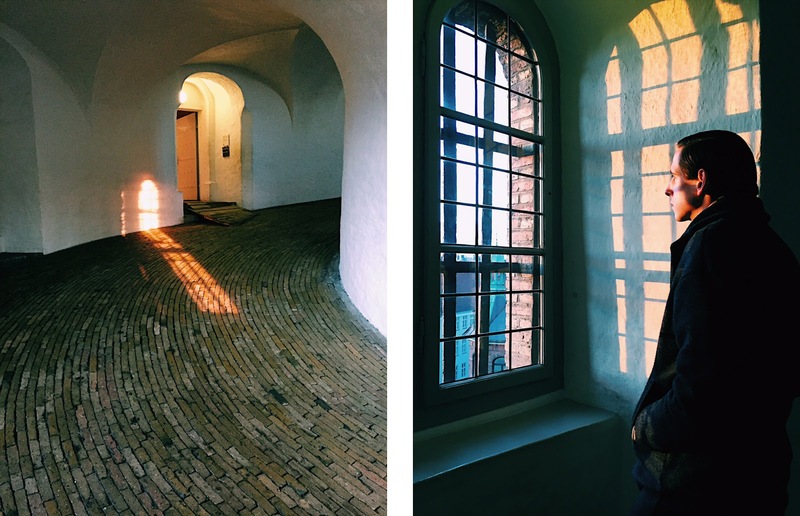 As the oldest functioning observatory in Europe, the architecture is amazing and incredibly serene. It’s only 36 metres tall but due to the round nature of the tower, you actually have to walk 209 metres to get to the top. Don’t worry, it’s good exercise and there’s plenty of natural beauty to get you to the top. By coincidence, we actually started making our way up as the sun was beginning to set, cue beautiful lighting conditions and a crazy sunset at the top. If you listen to only one recommendation from this post, make it this one – go late on your adventures, when the sun is on it’s way out and take in the beautiful city you’ve just spent your time exploring. Like this? 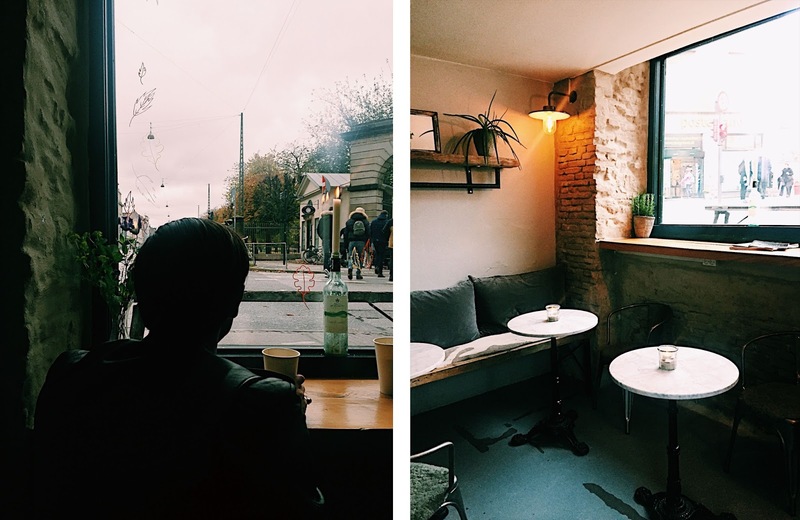 Have you checked out my creative guides to Berlin, Amsterdam and Milan? Up next – it’s Morocco! 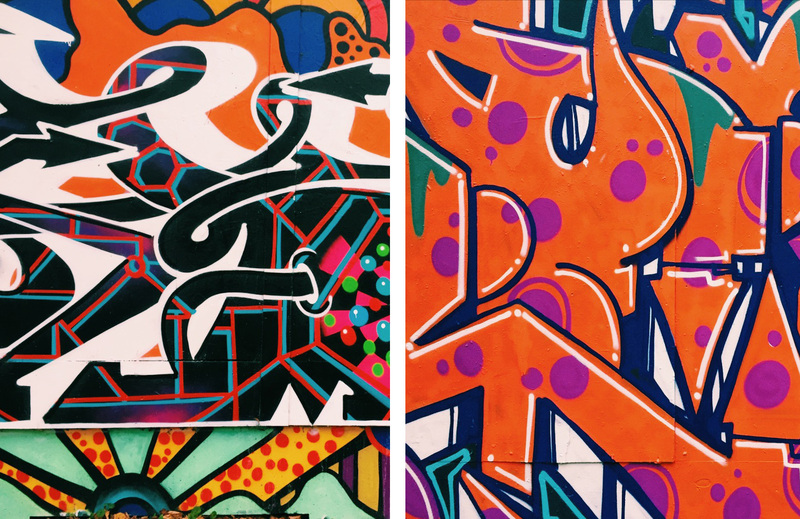 Next PostThe Instagram Addict | Six Amazing Accounts to Follow NOW! I absolutely loved this!!!! I've been dreaming of visiting Copenhagen for sometime now and you've made me want to visit even more. Ah I absolutely love this post! I'm hoping to visit Copenhagen over Easter and now I can't wait!